Three days in a row, the world's biggest cycling stars will fight it out on the roads of West Denmark. Below, you'll get a description - both verbal and visual - of the most interesting sections of the routes. Read more: Truths and half-truths about the Danish Giro stages. Giro d'Italia 2012 takes off on May 5. And it happens far away from Italy: In the middle of the Danish perninsula Jutland. Herning is the city of both the start and the finish the first two days. The third day of the visit in Denmark starts and ends in the city of Horsens. According to the official route description of the Giro, all Danish stages belong to the category "flat", and indeed, there are few really complicated stretches to talk about on the 405 kilometers of Danish asphalt that will soon show up on millions of TV screens. That Italy's climbs in general are tougher than those of Denmark is one thing. But at the same time, the organizers have chosen a way through the landscape that is pretty undramatic, even by local standards. But now let's take a look at the details of each stage. Shortly after take-off, the riders must make a 90 degree turn to the left at Dalgasgade (note: most street names in Denmark include the words "-gade" or "-vej" - meaning "street"/"road"). That's succeeded by a number of similar sharp turns with short distance between them. A challenging section in rainy conditions! At present, it is not possible to follow this part of the route - in a car -, as the square/Bethaniagade is blocked. The last half of the course is more straight. There is little elevation. However, it should be noted that the final stretch on H.P. Hansensvej is slightly uphill (480 meters with a grade of 2.1 percent in average). The film above shows the most interesting sections of the first stage. Text in English. Click on the map to go to the route description in Google Maps (in Danish). The rest of the stage is pretty uncomplicated. The only thing that can cause inconvenience for the peloton is crashes or maybe a fiery south-westerly wind. The finish is situated at H.P. Hansensvej like the day before. The film above shows the most interesting sections of the second stage. Text in English. This is the most hilly of the three Danish stages. It begins in Horsens, some 60 kilometers south-east of Herning. Here too, the master start is at the city square from where we move on to Løvenørnsgade and Lichtenbergsgade. Then, the peloton goes south. Having rounded Juelsminde (21 kilometers), the riders turn north, as they climb the long, but not particularly steep hill at the village of Klejs. 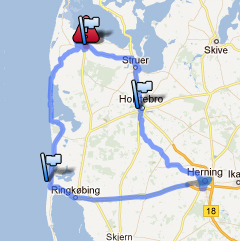 After that they return to Horsens, and the ride continues further north. At Ejer Bavnehøj, the Giro d'Italia arrives at the "roof of Denmark" (a little more than 170 meters above sea-level). This is marked by, first, a sprint for the mountains' jersey, and then a picturesque descent towards the town of Yding. The greatest challenge, in terms of terrain, is waiting after further 10 kilometers: Smedebakken at Tønning. A constant climb with sections at around 10 percent grade. The route back to Horsens has no real obstacles worth mentioning. In Horsens the riders must pass the finish line on Strandpromenaden three times, before they can prepare for the finish on the fourth round. When crossing the line, the Giro will at the same time say goodbye for now to Denmark. The film above shows the most interesting sections of the third stage. Text in English.